and this couldn't be easier to make, perfect as a workshop make and take. Is more or less a total case from this beauty here. The pumpkin is made with the aid of the oval punch, the tendrils are stamped with the Baroque Motifs stamp. Elegant Eggplant card stock and grosgrain ribbon, Old olive and Eggplant ink, Pumpkin Pie card stock and ink for the edges. Next a quick box I designed myself, it uses the new Word Window punch to make the clever handles. 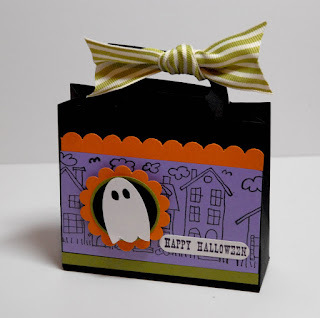 Basic black, Pumpkin Pie, Orchid Opulence and a hint of Old Olive card stock, neighbourhood wheel and a cute frightful little Casper made from oval punch and the scallop edge punch( isn't he cute? ), oh and check out the new ribony lushness. 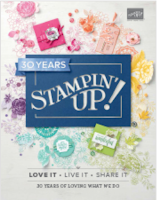 We had a fab night stamping, sharing, laughing thanks to Susan's rather spicy joke and getting to know each other better. I cannot wait till the next one and if you are thinking of coming along get 10th of November and 8th of December in your calendars. Look forward seeing you. So I did some stamping at the weekend, I always have thank you cards to stamp so here s an attempt to get things started. 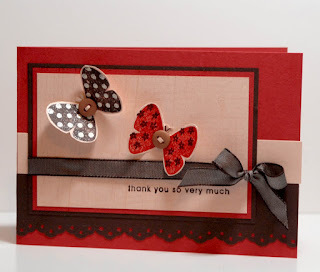 New Flight of the Butterfly stamp set, Ruby Red, Blush blossom and Chocolate Chip, new fancy eyelet border punch and some taffeta chocolate ribbon. 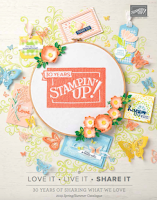 lovely cards once again, gosh for somebody sho has lost her mojo these are fab. So excited about the word window punch first thing I'm going to get. 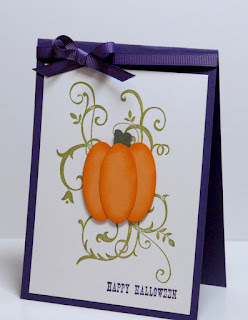 What an elegant Halloween card...so pretty and different from the usual Halloween theme...beautiful. Wonderful cards! Love the pumpkin vines & your punched out ghost! Lovely stuff - esp the pumpkin! Three fab cards Monica - don't know what you mean about mojo!! These are wonderful. I just love that pumpkin.